MSI's been kicking out PC hardware solutions for three decades now, getting its start with motherboards and later getting into the graphics card business. To celebrate 30 years of hardware design, it's releasing a limited edition GeForce GTX 1080 with a rather spiffy looking cooling solution. The limited edition card is liquid cooled with a custom designed full cover EK waterblock. MSI describes the look as "exceptionally classy," a point we won't argue, and if you want to add some additional bling you can light up the card with infused RGB LED lights through the MSI Gaming app. This is a closed loop cooling solution with no setup or maintenance required. It's fully assembled and needs only plugged into a PCI Express x16 slot with the accompanying radiator assembly mounted to a 120mm fan slot (and of course it needs connected to your power supply). The full cover water block is made from precision crafted aluminum. Underneath it all is a nickel-plated copper base that takes the heat from the Pascal-based GPU. It's all attached to a water cooling radiator that combines EK's CSQ design with its latest radiator core engine. High-static Vardar fans developed in-house and a DDC pump round things out. The card's Silent mode keeps clockspeeds at stock based on Nvidia's reference blueprint, whereas the other two modes kick things up a notch. Power requirements are similar to that of a stock card—500W or greater PSU, though you'll need both a 6-pin and 8-pin PCIe connector instead of just an 8-pin. 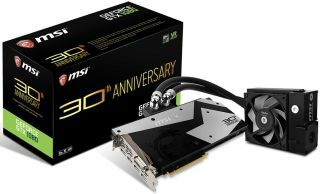 MSI didn't say when the 30th Anniversary card will be available or for how much. As a point of reference, its liquid cooled GTX 1080 Sea Hawk X graphics card streets for $1,150.